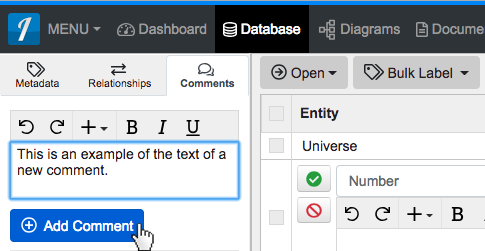 Within 'Entity View,' locate the 'Comments' panel and click within the 'New Comment…' input field. Type in the comment you would like to add on the entity and click the 'Add Comment' button. This will cause the 'Comments' panel to refresh to show your new comment listed at the foot of the panel. This will cause the 'Comments' panel to refresh to no longer show the comment which has just been removed. * Note: Comments are visible to anyone shared on your Innoslate project, no matter what level of project permissions you've given that Innoslate user. 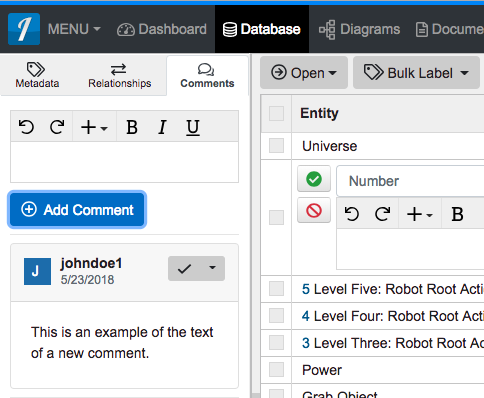 Within ‘Entity View,’ locate the ‘Comments’ panel and click within the ‘New Comment…’ input field. Type in the comment you would like to add on the entity and click the ‘Add Comment’ button. This will cause the ‘Comments’ panel to refresh to show your new comment listed at the foot of the panel. This will cause the ‘Comments’ panel to refresh to no longer show the comment which has just been removed. * Note: Comments are visible to anyone shared on your Innoslate project, no matter what level of project permissions you’ve given that Innoslate user.